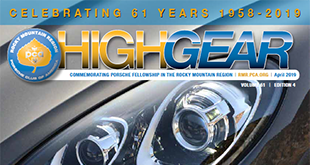 HighGear (ISSN1061-1746) is the official magazine of the Rocky Mountain Region Porsche Club of America (RMR/PCA) and is published monthly. Non-RMR subscriptions are $35.00 per year. The opinions and views appearing in HighGear are those of the individual writers and do not necessarily reflect the official opinions of the RMR/PCA, PCA National, or this magazine as an official RMR/PCA publication. Additionally, none of these organizations nor this publication assumes any responsibility for the accuracy of material provided by individual writers and contributors. These rates are monthly; advertisers with annual contracts receive a 10% discount. Classified ads are free for RMR/PCA members. The deadline for classified ad submission is the 10th. Ads run for two months. Send your ad to newsletter@rmrporscheclub.com.